Ahhh. Like so many things in life, it depends! The considerations are allergy and taste. “Unfortunately, mangoes have some not-so-nice relatives in the plant world. 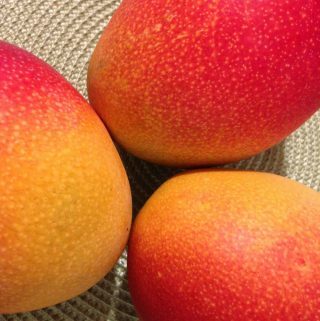 Mangoes are in the family Anacardiaceae, the same family as Poison Ivy, Poison Sumac, and Poison Oak. Like its nasty relatives, mangoes produce the oil urushiol, a mixture of several chemicals that produces a characteristic skin rash in sensitive individuals. Fortunately, only the mango tree’s sap and the fruit’s skin contains the urushiol, and it is produced in small quantities. Some sources say the fruit’s flesh contains very low levels of urushiol. 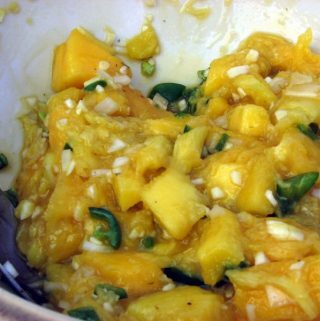 If a person is sensitive to urushiol, they may potentially have a reaction after touching the mango’s skin, particularly if there is sap present. Essentially, one has to determine their own sensitivity to the peel of a mango and proceed accordingly. A lot of people eat the peel; a lot of people don’t. It’s personal preference.